My family's March 24, 2013 cruise on the Celebrity Silhouette has been both a testament to the things I love about Celebrity Cruises and what can happen when you are sailing (a) in the Caribbean, (b) during Spring Break and (c) when the weather has resulted in five consecutive days of clouds/rain/wind and few days of 7-10 foot seas. In short, this is not the best cruise to measure the Celebrity product. With that proviso, and with a lengthy travelogue/analysis to follow, what are my main observations, comments and overall impressions? 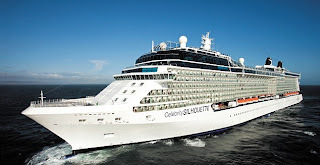 - I really like the Celebrity Silhouette with the addition of Qsine and Lawn Club Grill, restaurants her older sisters lack, but miss the larger, more open, Lawn (but something has to give somewhere). She is one of the finest larger cruise ships at sea. - Celebrity’s Guest Relations is fantastic (and it is no wonder some of their top staff have wound up working for Seabourn). 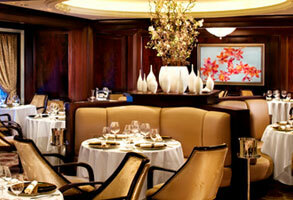 - Murano remains one of my favorite restaurants at sea for ambiance, cuisine and service. - The combination of the Premium Beverage Package, Ultimate Dining Package and Pre-Paid Gratuities is both a fantastic way to put together an upscale experience while also providing great value. - Other than by the pool, the buffet (at peak hours) and outside the main dining room before dinner you really do not have a sense of crowds or crowding. - The ship itself is beautiful and creative and elegant. A beautiful library overlooking the atrium (with its floating giant ficus tree) to the wicker lounges by the grass bocce court to the ice-covered martini bar to Cellar Masters wine library den feel, you can’t help but be impressed with the design. 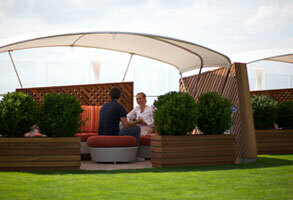 - Service outside of Murano, Lawn Club Grill, Guest Relations and Shore Excursions was a bit below my expectations. With a room steward that did the minimum at best, service that was overall quite good, but with more inconsistency than on any previous cruise. Notably, overall the bar staff overall seemed exhausted, disinterested and unengaged. A big qualifier: This was a rough sea, cloudy, rainy cruise over Spring Break so the staff was required to be going full out full time, so I won’t hold it against them (save two individuals!). 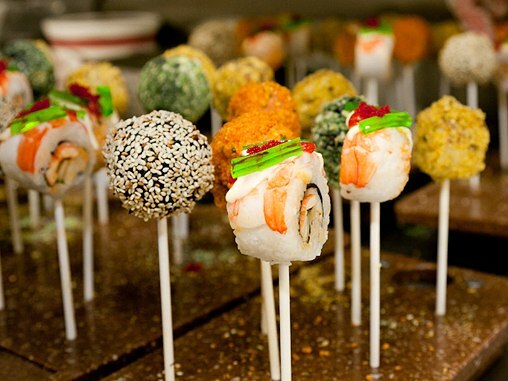 - The cuisine very good to excellent with a truly wonderful variety. Murano stands on its own, but the other specialty restaurants served very good to excellent cuisine and the buffet has great diversity (blood pudding to frittatas to pickled herring to made-to-order omelets at breakfast, for example), the pizza, hamburgers and hot dogs were much improved from my last cruise and the ice cream varieties were great. Our flights into Fort Lauderdale went without a hitch and our luggage arrived (though one bag arrived before our flight…a/k/a the bag was lost and then made it onto a sold out flight that had better timing then ours). We then took a taxi to the Candlewood Suites because I figured we were getting in at 11:00 p.m. and departing at 11:00 a.m. so why waste money on an upscale hotel room. This was a great concept, but a bad idea. When my family of four entered our suite, my son said, “This doesn’t look like the picture! Well, I kinda guess it does.” My wife and I retired to the bedroom and left the kids in the living room with a sofabed and recliner. I awoke to my daughter asleep on a terribly sagging mattress and my son asleep on the floor. I felt bad; especially when my son said the floor was more comfortable than the sofabed or the recliner. I knew it was best to arrive at the Port Everglades Cruise Terminal no later than 11:30 a.m. in order to be ahead of the crowds, so after grabbing a taxi (which now that Yellow Cab in Fort Lauderdale pretty much has a taxi monopoly can be a real challenge), we arrived to a very efficient and quick check-in and were aboard the Celebrity Silhouette before noon. Upon arrival we immediately did two things: Purchased our Premium Beverage Packages for the adults and Premium Non-Alcoholic Beverage Packages for the kids. (You can purchase these in advance, but we had onboard credits I wanted to apply to them.) Then we purchased the Ultimate Dining Package for the adults, which gives us unlimited access to all of the specialty restaurants (Murano, Qsine, Tuscan Grille and The Lawn Club Grill) as well as Bistro on Five and The Porch for breakfasts, lunches and dinner. 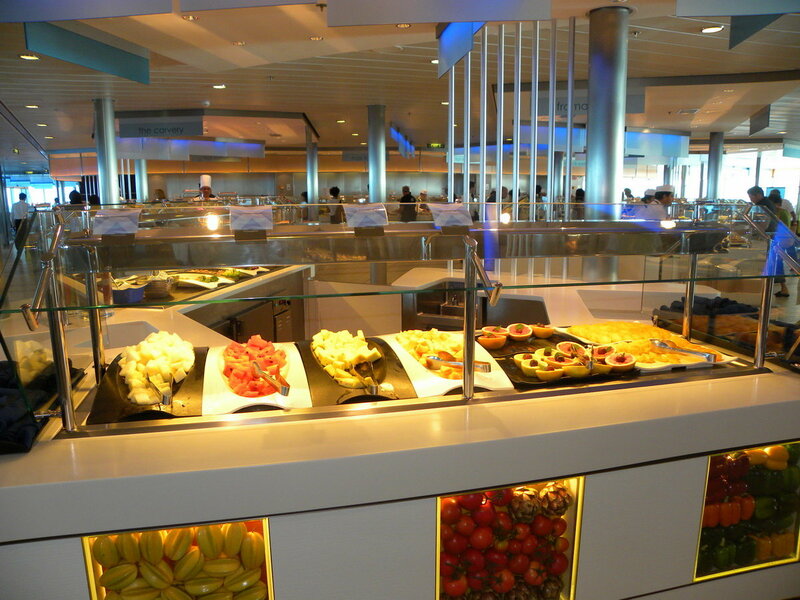 (All dining packages except for the limited availability Ultimate are available to purchase online prior to your cruise.) 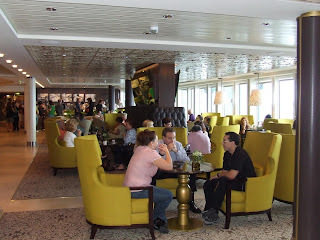 That accomplished, and having already sailed on the sisterships Celebrity Solstice and Celebrity Equinox, we decided to have lunch at Bistro on Five. 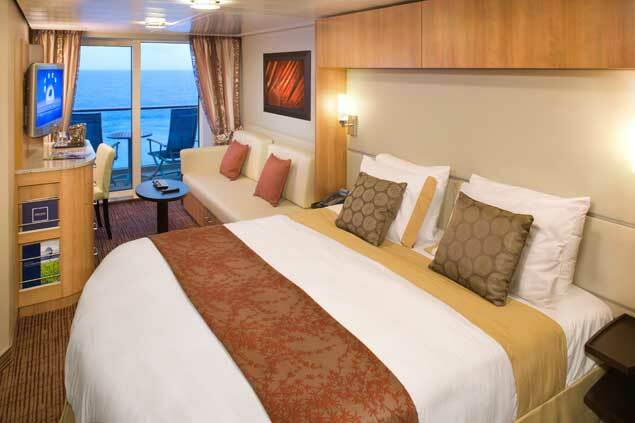 When we found our staterooms, located overlooking the stern of the ship on Deck 11, they were in great shape and with a fantastic view. The bed was extremely comfortable and the upgraded bath towels, showerhead and amenities were appreciated. 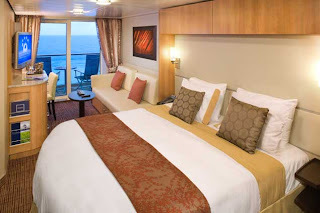 While our Captains Club amenities were missing (and did not appear until Day 3 – not good) we were not aware of any of the special events, the steward for our children’s adjacent stateroom had the divider between the two balconies opened so we had an extra-large balcony and easy access between our staterooms. (Curiously, we had different stateroom attendants.) Our luggage arrived well before sailing, which was a plus. That done it was time to wander. I stopped by the iLounge (a/k/a internet room) which Celebrity has partnered with Apple offering Macs and lessons on iPads and iPhones to the iDon’tknows to set up my wireless internet account. The pricing is a bit steep, but with my work and two teenagers “needing” to be connected there is a $399 package for about 28 hours. This makes the Seabourn $399 package for “always on” internet for the length of your voyage a relative bargain…I don’t think charging these amounts for internet access are appropriate. After a rather painless muster drill, it was time for dinner in Qsine; which normally is an extra $20 or so per person charge). I understood this to be a cool restaurant where you ordered your meal off of iPads, so I figured it would be fun for the kids. I was wrong…sort of. This restaurant (which replaces the Celebrity Solstice’s and Celebrity Equinox’s Silk Road Asian-fusion restaurant) does have iPads for menus and it is fun, but the thing that makes the restaurant cool is – wait…wait…- the food! 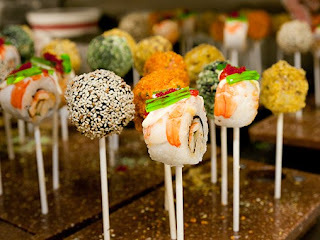 Qsine blends cuisines of all sorts with very creative presentations such as sushi lollipops to a sort of dollhouse filled with all kinds of Mediterranean mezes. 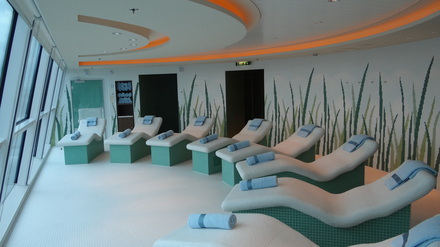 It is great for one night of a seven day cruise, but I am not sure it would be as much fun the second time. One negative: The service was slow again. I didn’t say anything, but the staff was keenly aware and offered us four coupons to use at Bistro on Five. With my dining package they were really not worth anything, but the proactive offer was excellent. My wife made it an early evening so I had a bit of a walk-around, checking out the preview of the shows (not good…but I don’t generally like the shows) and eventually winding up at the Sunset Bar overlooking the stern to enjoy a cigar. Ironically three decks just above my stateroom no smoking balcony (which remained private)…noting that Stateroom 1676 has a wider balcony then the others on the stern. As I smoked my cigar and enjoyed my Glenfiddich (served only one pour at a time, as it seems that with the Premium Beverage Package you are not permitted to order a “double”) I noticed the seas were getting a bit of a swell. It was a sign of things to come. I woke up to gray skies and a constant swell. This, unfortunately, would be the theme for the next five days. As it was a Sea Day we relaxed (not by the pool!) and enjoyed the ship. - The internet package I purchased didn’t show in the system, though my account had the $399 charge. The staff at the iLounge was iArrogant and talked at me rather than listen to my issue and then told me I didn’t buy a package, so I bought another; only to later see on my stateroom account that there were now two $399 packages charged. Got that fixed. - My kids’ SeaPass cards stopped allowing charges. I authorized the charges when I signed up online and again when we checked in. Apparently with all the children onboard Celebrity decided to shut down all of the kids’ cards and have Dad or Mom sign another form before charges could continue. Done. But then it happened again. And I had it fixed again…interrupting my dinner. - Our dinner reservations in the various specialty restaurants were all messed up. Two or four dining? Which restaurant? Which time? We got that sorted out. Again, twice. As a travel agent I get it, so these were all minor hassles, but these sorts of things can really be upsetting to someone who isn’t as knowledgeable as I am or who doesn’t cruise as often as I do, or has limited credit on their cards or are very schedule orientated (so a later or earlier dinner means missing the shows they really enjoy on their cruise) or whose kids are concerned they did something wrong. While each was corrected, at the time it seemed that a battery of errors and…just for a moment…really put me in an “Another problem! Really? !” mode. I should note that Guest Relations overall was excellent in dealing with each issue and owning up to mistakes rather than making excuses. They also made sure, after the fact, that I remained satisfied and that their solutions were, in fact, solutions. This is so important because one cannot expect a perfect cruise, but one should expect a friendly and efficient was to have any issues resolved. Guest Relations Manager, Christina, and Guest Relations Officer Valeriya, did a great job with this…even during a Spring Break cruise with lots of children, heavy seas, clouds and rain. The second formal night evening they even delivered to our stateroom a bottle of champagne for me and my wife and chocolate-covered strawberries for the kids…just because. A nice, though unnecessary, touch. But I have digressed and it is now back to the travelogue! With the kids doing their thing, my wife and I toured the ship, checked out the Bulgari and other shops and had a capuccino at Cafe de Bacio. Then we had a nice light lunch at Bistro on Five. Then I, believe it or not, took a long nap. Afterwards it was off to the Persian Gardens, which is an area of the spa where there is a steam room, aroma therapy room, rain showers and heated lounges. A couple of minor irritations: The door into the area is very noisy so every time someone walks in or out there is a slam; and, the water fountain chillers are also very noisy. I would think that in this quiet area those things would have been attended to. Two things of note: People that are fully clothed can tie up the lounges and some park themselves there for hours (not the purpose of the lounges) and the sauna is a tiny affair located in the men’s locker room so there is some disjointedness and no sea view (as exists on the Millennium class ships). For dinner we headed to Murano on the first of two formal nights. (Normally there is a $45.00 per person extra charge to dine here.) While the restaurant has quite an elegant fell, I was not feeling well, so part way through my daughter replaced me as my wife’s dinner companion after I ordered Diver Scallops followed by Dover Sole. I heard the food and service was very good. I don’t know what it was, but after a good night’s sleep, the next day I felt 100% better. Back on the ship, I actually took another nap and then a jaunt to the Persian Gardens, before heading to the Molecular Bar for pre-dinner drinks. I had sampled a couple of the nitrogen topped, strange combination, drinks at a Celebrity Cruise Pop-Up Restaurant event in New York City and knew my wife would enjoy them. She did. It was then dining at Murano again and I can say that I enjoyed the food (I had a quail salad and duck confit) and service, both of which were top notch. We were surprised by our children stopping by and they joined us for dessert. Both went for the chocolate soufflé over my suggestion of the Grand Marnier soufflé. No complaints from either, but I think they will listen to Dad when we are back dining as a family later in the cruise. After a bit of walking around we headed to Paradise, a favorite rustic restaurant right on the water where excellent conch chowder, awesome conch fritters, fried plantains, etc. and, for me, a turtle burger (not very good) were on the menu along with a drink I remember from my younger days, “Hurricane from Hell”. That was just enough to bring smiles to everyone’s faces and then we did a bit of shopping. (My guilt for the lousy weather and seas was getting the best of me!) It was then back to the ship for a much needed rest and visit to the Persian Gardens. I mean with temperatures in the 70s, grey skies, no physical activities, it gets tiring! 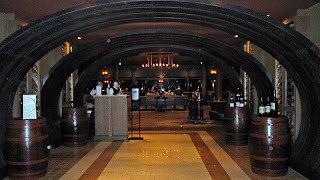 We had dinner at Tuscan Grille; a third extra charge restaurant (I believe $25.00 per person.) The Maître de was not good and pretty much ignored me until I said something. When I told him my name he asked for my stateroom number. Yes, I forgot that little touch. Anyway, not being terribly impressed, I was not really looking forward to a good dining experience. Fortunately, a really good one was delivered with cheerful service (Selma, our assistant waitress from Turkey was exceptional). I had a very good cioppino and a pretty good seafood risotto. (I am very picky when it comes to risotto, so there is no shame there.) My wife’s fillet mignon was quite good, but she felt it had been sitting under a warming lamp for a few minutes…probably waiting for the risotto. Our next rainy day was Falmouth, Jamaica. This was, for the Goldring family, a “sea day” as there is not much I find in Jamaica that is worth venturing out into the country for. The fact that the weather was lousy made it a good decision. We did take a bit of time to walk around the Disney-esque village that Royal Caribbean has essentially created. I noticed over a dozen jewelry stores servicing the Liberty of the Seas and the Celebrity Silhouette and wondered, “Why do so many cruise passengers demand the absolute lowest price for their cruise (with many demanding discounts, rebates, etc.) and then spend $1,000 for a piece of jewelry that is probably worth only $200?” Could it possibly be all of the in-your-face marketing in the daily program, on the ship’s television and the ship’s shopping expert? But I digress…as I do. As we were caught in the rain, we went into one of the eleven Caribbean Margaritaville Restaurant locations for a light lunch and some time out of the rain…while they played disco music. Huh? (Note: If you buy a soda for only $7.95 you have your choice of a souvenir glass or a bong! Only in Jamaica.) It was then back on the ship. Before dinner we were back at the Molecular Bar. I would have preferred sitting in Cellar Masters, which has an excellent variety of wines and a number of Enomatic Machines which let you choose the size of your pour of dozens of extraordinary wines. The problem: The Music/Noise. Celebrity has been experimenting with what can only be described as various levels of upbeat and generally loud drum beats with some sort of melody (maybe) in the background. I am assuming it is supposed to be “Modern”, but it most certainly is not “Luxury”…as Celebrity pushes its “Modern Luxury” branding. I could hear the beat in the Persian Gardens, in Tuscan Grille, in the bathrooms, etc. Mindboggling…but the coupe de gras was the music played in the Molecular Bar that evening. The words to the “music” were about a guy being slipped psychedelic mushrooms by a girl he met. Seriously!? I would note that finally on the second to last night “normal” music returned to the main lobby/atrium so we could enjoy the venues, like Cellar Masters, we had been chased out of. Our second try of Tuscan Grille wound up with more issues than the first, which was very disappointing since the servers were very good and the food was too. Our 8:00p.m. reservation wasn’t ready, allegedly because someone was just finishing up their dessert, so it would be 10 minutes…which became 20 minutes when they were signing their check…and then our table was ready…BUT nobody had left the restaurant. I hate being played for a fool and this was the second bad event with the maître de at this venue. As the service was quite slow, our servers were very honest with us and said the restaurant was overbooked so the kitchen was backed up. Hence, we were being stalled up front and our meals would be delayed even more once we were seated. This presented a problem for our children so they had to rush through their main course and dessert as the “critical” 10:00 p.m. social clock was chiming. It is a shame when an enjoyable evening of good service and food is overshadowed by such things. For me this was a serious service flaw! I did not pay a premium so that I could be ignored, lied to, delayed, etc…just so the Tuscan Grilles Maître de could show better numbers in “his” restaurant. We decided to check out the Sin City Adult Comedy Show. It was OK, though some in the crowd really liked it. There were a couple of one-woman burlesque-light performances, a short warm-up act and the headliner. Obviously there are limits on what can be seen and said, but a little bit of naughty and adult humor was provided. Now for our final chance at doing something on land: Labadee, Haiti – Royal Caribbean’s private resort. The good news is that the seas were now only a nice swells. The bad news was the swells were large enough that they almost prevented us from docking. The good news is that we docked. The bad news is that the rain was strong as we arrived and the sun never appeared. Oh, and my son’s day of jet-skiing was cancelled due to the swells. However, my wife and kids did do zip-lining and that was fun for them. Labadee has, to me, a Disney feel with pristine faux shacks and neat plantings with for rent cabanas, a water park and crafts market (sold at cruise ship prices by local Haitians…no matter where the stuff was made). 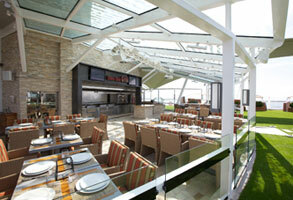 A faux barbecue lunch of hamburgers, hot dogs, chicken legs, ribs and salads is provided. Drinks are charged to your SeaPass card…if they didn’t run out of beverages (which I found to be the case for both beer and soda). Lunch on the ship would have been better, but we were trying to make somewhat of a day out of it. My wife likes the place (having been there on a sunny day when hosting a Royal Caribbean cruise a few months ago) and I must say that if I had a beautiful day and I had rented a cabana I probably would have a better feeling about Labadee. It is highly rated…just not on a cold, rainy, day with no watersports available. Back on board for a rest, a visit to the Persian Gardens and another fabulous dinner at Murano. Goat cheese soufflé, lobster prepared tableside, cheese trolley and the Murano sharing dessert with exceptional service by the staff on the other side of this petit restaurant made for a wonderful evening; the second formal night of the cruise. As I mentioned earlier, the music has become more Celebrity-like so starting off at Cellar Masters really made the evening a wonderful one ending up with a walk about the Lawn Club and a chat by the Sunset Bar overseen by a full moon dancing through the clouds. Sun. Yes, the sun! I awoke early for our last day, a sea day. The sun was shining, the sea are fairly calm and there is a cool breeze (rather than gale force winds). It is a perfect day. I walk the almost empty decks and see that about 80% of the lounges by the pool have been claimed by towels, books and shoes…but not many bodies! Not good. A take a quiet whirlpool by myself and then walk some more with a cup of coffee. I am finally on my Caribbean cruise! I came back to my stateroom to finally truly enjoy my balcony and there is a knock on the door. The room steward is delivering receipts for my American Express Platinum Card Specialty Dining credits. Really? The last day of the cruise? They should be confirmed at the beginning of the cruise. Another “Dunno”. Not a biggie for me, but it would be a hassle for someone who didn’t take the specialty dining package and wondered if the credits were applied to his/her account. Having just eaten a much larger lunch than anticipated, we thought we best push our last dinner – at Murano, of course – to 8:00 p.m. rather than the earlier 6:30 p.m. we had reserved. Stateroom 1676? No problem. I am OK with being Mr. 1676 rather than Mr. Goldring as it gets the job done nicely! A lazy afternoon catching a few rays, taking a nap and writing and then, of course, my last visit to the Persian Gardens before a final drink enjoying the view from my balcony before packing. A final family dinner at Murano (again excellent) brought our cruise to a close. But in Murano they spoiled the children and even made them strawberry crepes with ice cream tableside…over and above their desserts and the petit fours. With the forced reduction in Customs and Immigration staffing and our 10:15 a.m. flight home we decided to carry off our own luggage. It was a very good idea. There was a bit of an issue just getting an elevator with room for us, so our 7:30 a.m. start didn’t get us off the ship until 8:10 a.m. and through Customs and Immigrations to our private transfer until 9:00 a.m. For those that disembarked normally, I could easily see them waiting in long lines well past 10:00 a.m. There has to be a better way, but until there is: Keep this ordeal in mind. So did I have a near luxury experience? Honestly, it is something I am still contemplating. I have to finish balancing the misses I encountered against what I probably would have encountered on a luxury cruise line during Spring Break with lousy weather. Did our Celebrity Silhouette cruise provide a sufficiently excellent experience to want to do it again? We booked a family cruise for next summer visiting Iceland, The Faroe Islands, UK and Norway on the Celebrity Eclipse.